Timberidge Lodge is a modern log home and we've just made it even better! This home features new carpet, granite countertops, wireless internet, two 50' flat screen tvs, pool table, all new flooring on terrace level, and new rocking chairs on the deck to enjoy fantastic views. 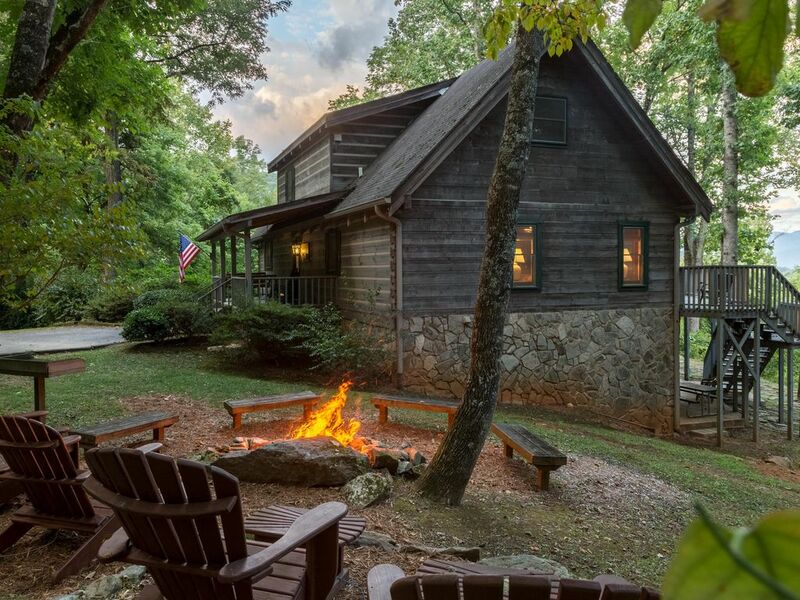 It's situated on five acres within a private, 120-acre neighborhood just outside Sylva, North Carolina, and can accommodate as many as 14. Its open floor plan with great room, kitchen, dining, and master bedroom all on the main level makes it cozy enough for just a few guests. The three additional bedrooms, and a large daylight terrace level den makes it perfect for family reunions or get-togethers with two to three families. It is just two and one-half hours from Atlanta, 30 minutes from Cashiers and Franklin, and 45 minutes from Asheville and Highlands. Hiking, rafting, fishing, and water and snow skiing are just minutes away. Sylva's Historic Main Street, Dillsboro shopping district, and The Great Smoky Mountain Railroad are just ten minutes from the lodge. - June 15th, 2019 - August 16th, 2019 there is a 7 night minimum. Saturday - Saturday stays ONLY! - Thanksgiving and Christmas have 7 night minimums. This cabin will consider 1 small dog on a case to case basis. Pets must be pre-approved and tenant is required to sign the Pet Policies Addendum of our Vacation Rental Agreement. Additional, non refundable pet fee will apply. This was an amazing amazing amazing vacation. I felt like I was home. I would come back to stay and recommend someone else. The layout was beautiful. One recommendation is to have more TVs. Love love love this place. The location was really nice, a quick drive to everything we wanted to do. The cabin had plenty of room and we were definitely not cramped. It was also dirty.The deck was full of leaves and looked like it was not blown off all year. We needed to clean the chairs before we sat down. The kitchen seemed to be superficially cleaned but there was a film on everything. The entire house had the faint smell of cigarette smoke as well, we will not be staying here again. The trip would have been much better if the cabin was actually cleaned. It struck me as kind of funny because we weren't allowed to check in early because "the cleaning crew would need the entire 6 hours to ensure it was in good shape." This cabin couldn't have been more superb. From the moment you walk in you feel like you're at home in the mountains. Truly a one of a kind place that we hope to visit again. Thanks so much for your hospitality. We had 3 families. It was great to spread out into different activities at the house and come together for meals or ok n the porches. Inspiring views. Peaceful mornings. We had 4 generations stay at the cabin. There was plenty of room for everyone. We loved the walk to the waterfall. It was the perfect place to relax and unwind. We recommend the cabin to anyone who loves the mountains and all the nature you want to enjoy.